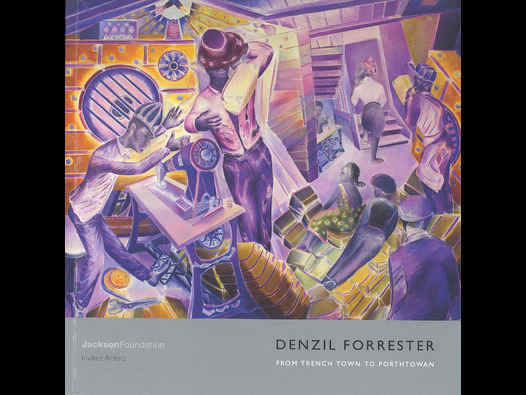 I first saw Denzil’s paintings at his Royal College of Art degree show in 1983. It was thrilling and unusual to see depictions of East London’s ‘Blues’ and Dub clubs and clubbers painted in those dynamic, large scale works. I was humbled and in awe of the ambition and realness of the vital, imposing canvases. It was an exciting time for painting and to be a painting student - London had hosted important exhibitions of Max Beckmann and Phillip Guston and the huge survey show at the Royal Academy in 1981 A New Spirit in Painting, introduced us to a new wave of German and American artists working mostly in a figurative expressionist tradition. Denzil’s work stood out however because it portrayed a world and scene that was scarecly pictured in the fine arts… one that was known to me through music and one that captured the impact that artists such as Linton Kwesi Johnson weere having on the times.” [ellipsis in original]. The catalogue was lavishly and extensively illustrated with reproductions (including details) of work by Forrrster, from the 1970s onwards. Fascinatingly, one of the two reproductions of work from the 1970s was a landscape titled St Just, an oil on board, 94 x 63 cm work dating from 1979. This, Forrester demonstrated longstanding associations with the county of Cornwall. Not only that, but he demonstrated a verifiable connection to St Just, the small Cornish town in with the Jackson Foundation ewas now located. The catalogue was bookended by photographs of Forrrester in his studio. The first, at the front of the catalogue, was an uncredited black and white photograph of the young artist as a young man, with full head of hair, in relaxed mood, working in his studio. The photograph towards the back of the catalogue was a double page colour portrait (again, uncredited) of Forrrester, in much more recent times, about to play a vinyl reggae record in his studio. The catalogue was punctuated with two poems by Linton Kwesi Johnson, Dread Beat an Blood, and Reggae Sounds.